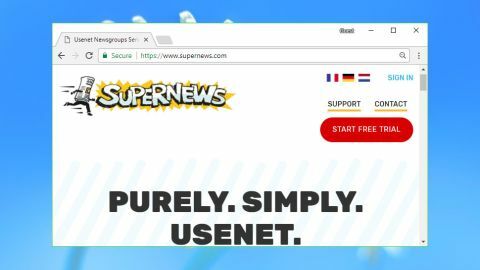 Supernews isn't a bad Usenet provider, but it's not great, either, and we see no compelling reasons to choose it ahead of the top competition. Supernews is a veteran Usenet provider which has been delivering reliable newsgroup access to the masses since 1995. The service has some good-looking specs: US and European servers, 5+ years of binary retention, 13+ years of text retention, and multiple copies of everything to ensure 100% completion across 110,000+ newsgroups. Supernews is focused on being simple and straightforward. There are no limits on bandwidth. No add-ons, like VPNs, to complicate your choices. And there's no need for a lengthy comparison table of plans, because Supernews has just one, offering the full and unrestricted service for $11.99 (£9.60) a month. This is easy to understand, but experienced users might wish Supernews had more flexibility. A cheap 7-day plan, discounts if you pay for a year upfront, maybe the ability to buy a fixed block of data which never expires? All common options with other providers, but not on the menu here. If the single monthly plan isn't an issue for you, the company offers a free 3-day, 10GB trial so you can try before you buy. This isn't overly generous – many companies offer 14 days and sometimes up to 30GB of data – but it's still enough to run basic retention and speed tests. Privacy is a key consideration when it comes to any Usenet service, and Supernews is very clear about its logging policy: "We cannot and do not monitor information flowing through or stored on our servers." The small print does include all the expected disclaimers, though. It's your responsibility to identify whether any download is legal or not. You must agree "not to violate copyright laws by transferring copyrighted works through our system." If you don't pay attention to that, the company may "cooperate with law enforcement officials and with other server administrators in the investigation of suspicious activity." Like most web services, Supernews holds some personal data on its customers, but the company is clear that this won't be shared for commercial reasons: "Supernews has never sold or rented customer lists or any other customer information, and Supernews will never do so." Built-in privacy tools are limited to encryption via SSL. This makes it more difficult for ISPs or other third-parties to snoop on the connection and see what's going on. Supernews doesn't have a VPN option to protect you any further. That's arguably a little inconvenient, especially for newbies who might not be comfortable about shopping for a VPN themselves. Still, buying a VPN separately is usually the best option. You'll typically get support for up to five devices, rather than the one or two covered by most bundled plans. There will be much more information on the features you're getting with the VPN, and if there are problems, you'll get better support by dealing directly with the VPN provider. Signing up with Supernews requires handing over your name, email and physical addresses. Payment options are card and PayPal only, but the trial means you're not charged until three days have elapsed or you've used 10GB of data, whichever comes first. We filled in the forms, and a welcome email arrived with the bare minimum of details: the server name, a reminder that we could use our email address as a username, and that was all. Need to know something more? Tough. The email doesn't worry about technicalities like ports, or give you links to places where you can find out anything further. Return to the Supernews website and you'll find a Support link, but that's also extremely basic. For example, it'll tell you that you can use ports 23 and 80 as well as the standard port 119, but there's no mention of SSL, port 563 or any secure alternatives. And don't waste your time looking for Usenet client setup guides – the website doesn't even suggest clients you might want to try. We suspect most Supernews customers will know these details already, but there are other related issues. Every user needs to know how many connections a server supports, for instance, but the website doesn't make it clear. A line on the front page suggests there might be no limit – "no speed throttling or connection limitations here" – and the support FAQ doesn't tell you either way. By trial and error we eventually figured out that there was a limit of 30 connections, but Supernews should really have made that more obvious in the first place. If you do have any trouble, Supernews boasts that its 24x7x365 support is "always ready to help". We checked this by raising a simple support ticket and it turned out to be true, with a helpful, friendly and complete reply arriving within two hours. Once you're up and running, the service mostly works well all on its own. Point your Usenet client at news.supernews.com, you're redirected to the nearest server to your location (US or Europe), and the downloading can begin. Performance was very acceptable, too. Just five connections were enough to max out a 40Mbps connection, and with 25 more available there's plenty of power here for demanding users. Supernews is a capable Usenet provider and its US and European servers plus helpful support are definite boons. But it doesn't excel in any specific area, and whether you're after longer retention, lower prices, more plan options or good website support, there are better deals around.